In Africa and Asia, leopards and black panthers are the same animal. Black panthers’ spots blend in with the rest of their coat. But when a team of researchers used a simple hack to modify field cameras, the spots on black panthers were suddenly revealed. Leopards don’t get the press lions do, even though they hold the widest territory of any big cat on Earth. You can find them anywhere from Russia to China to Africa. There was a time when we didn’t know that, because the traditional spotted leopard comes with a variation—the black panther. These cats have enough melanin to mask their spots, at least to our eyes. We learn, regularly, that our view of the world is subjective. 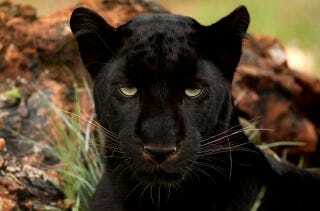 In visible light, the black panther appears solid-colored, but in infrared light its spots are clear. This gave scientists from the University of Nottingham, who were doing work in Malaysia, an idea. They were looking at field cameras, and getting a lot of pictures of cats that look like this. The researchers hope to use the spotted pictures to identify and study the local leopard population, and cut down on poaching.